EPI-USE is the world’s largest and most experienced independent SAP HCM specialist. What are our clients’ common requirements? They wish to implement SAP HCM in addition to other SAP areas. They wish to extend their current SAP HCM functionality. They wish to outsource some or all of their current SAP HCM implementation. What are the key benefits of the SAP HCM cloud? Access to EPI-USE’s SAP HCM expertise and best practices. When you’re using SAP for other business areas it makes good sense to add SAP HCM to the equation. There is no need to spend money on difficult-to-maintain additional integration and the product is mature, full-featured and integrates perfectly with the rest of SAP. By using SAP HCM in the EPI-USE SAP HCM Cloud you enjoy the advantages of an integrated system. This is achieved by creating an independent SAP HCM landscape that integrates with the core system through a SAP standard ALE connection, effectively allowing it to operate as a wholly integrated platform. Of course, you don’t have to worry about the HCM part because we manage that. 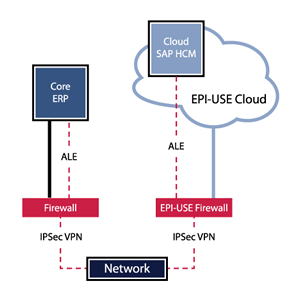 Why deploy SAP HCM on EPI-USE’s SAP HCM cloud? Talent Management areas, like LSO or e-Recruiting. Because SAP HCM skills are unique and specific, most organizations find themselves lacking. To ensure you get the most out of SAP HCM it is wise to strike a partnership with a company that will deploy the new functionality quickly, keep the system up and running and do the necessary upgrades and service pack application to ensure you are always compliant. EPI-USE has created a system landscape optimization service specifically aimed at extracting SAP HCM from existing SAP installations and moving it to the EPI-USE Cloud platform. The effect is that our clients can re-deploy their resources in other business areas where they can have greater value.